The iPhone remains a popular item for thieves, and if you steal a car with one in it, you may get caught with “find my iPhone.” All this in more, in the latest Apple-related crime roundup. The latest in an occasional series at AppleInsider: The latest in Apple-related crime. An attempt to rob a Berkeley, Calif., Apple Store by crashing a U-Haul truck through the front doors failed back in mid-December when the crash triggered the store’s alarm system. According to KRON, the attempted theft took place at 3:30 a.m. on December 13. But the alarm went off almost immediately after the crash, and the driver had fled the scene by the time police arrived. 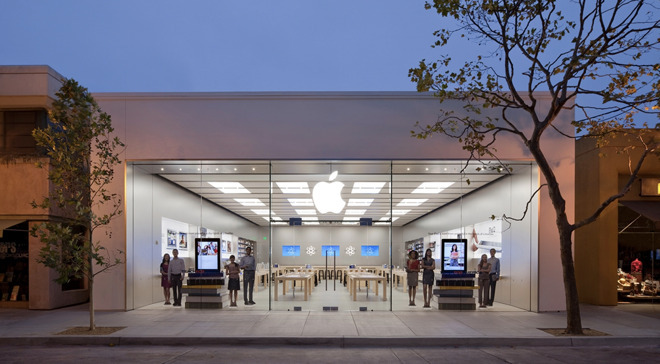 Apple Stores throughout California were the targets of thefts in the spring and summer of 2018, with charges eventually brought against several accused members of the ring. But, those thieves nearly always committed the act on foot. Speaking of the California Apple Store theft ring, one of the accused thieves has reportedly been set free. According to the Bay City News Service, one of those arrested for last year’s September theft at the Emeryville Apple Store, received probation and is now free. A Montana man is accused of stealing an iPhone X from a local wireless store, and then returning to the same store two days later to attempt to activate the phone. According to the Montana Standard, employees recognized the man, took the phone back, and called police. He was arrested a few weeks later when police saw him “yelling and screaming” on an area street. A group of thieves stole 13 iPad devices from a P.C. Richard & Son electronics store on the Upper West Side of Manhattan, Patch reported. Police say three thieves, two men and one woman, broke into a locked storage room in the store, late at night. A California family whose minivan was stolen from a daycare dropoff was able to find the car, and the phone in it, via Find My iPhone. According to Redding.com, the father immediately tracked the phone, and notified police, who found the car and arrested the thief. In yet another Find My iPhone case, the feature led police in Madison, Wisc., to the suspect, who turned out to be 14 years old. According to NBC 15, the owner of the car and iPhone was tracking them and notified police, who tracked the car to a Burger King location. A group of juveniles fled, including the 14-year-old driver. A man in England who has dubbed himself “Mr. Christmas” is accused of stealing a woman’s iPhone. According to The Sun, 61-year-old Andy Park was hired to a DJ a woman’s birthday party. After the phone went missing, the woman used Find My iPhone to track the phone to Park’s home. Park, described by the newspaper as a “festive fanatic,” is a minor local celebrity for his elaborate annual holiday celebrations. He has admitted to the theft. A Chicago man who was hired to babysit his young relatives on Thanksgiving night is accused of both stealing from the home and of abandoning the children. According to Chicago Sun-Times, the 28-year-old man was accused of taking several items from the home, including a watch, a jacket, and an iPhone 6. The man was arrested at the end of December, and prosecutors say he used the stolen phone to take several selfies, which were uploaded to the cloud and viewed by investigators. A “granny” in Ireland bought an iPhone 6 at a market for just 10 euros- the equivalent of $11.40 – and has been convicted of theft after the iPhone turned out to have been stolen. According to the Herald, the woman was “naive in the extreme,” according to her lawyer, but didn’t know the phone was stolen.